From the first Captain America Trailer we saw Tony Starks Father appearing in Captain America, well the Avengers Franchise doesn’t end there. It looks like the Cosmic Cube incarnation in the movie wont be a Mr Fantastic invention for obvious reasons but a trinket of Thors Father Odin. 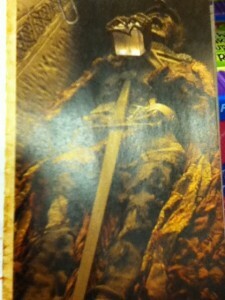 The first clear picture comes from a picture of the Captain America collector cards. 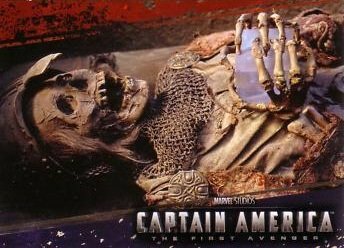 The picture shows a Viking called Sohmidt buried with the cube. The cosmic cube is described as a mystical artefact that was originally called the Tesseract of Odin. The cube is discovered in a small town in Norway. It’s mentioned that the Viking Sohmidt who owned the cube was severely scarred after finding it. This might be the origin of the Red Skulls face too. I love this movie already check out the global release date schedule for more accurate dates of the movie as it’s out in a few weeks.